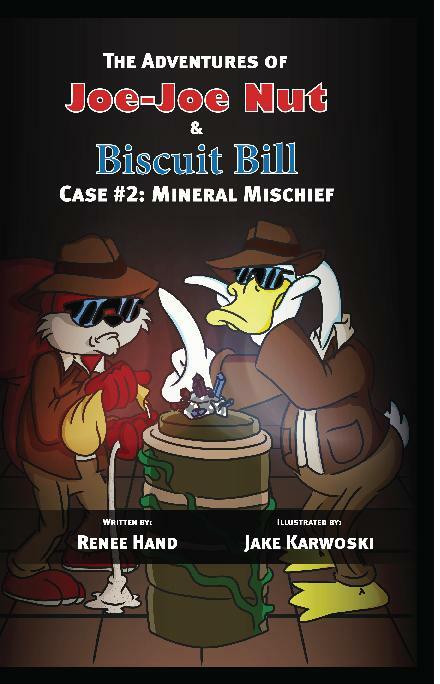 Joe-Joe Nut and Biscuit Bill are back with another mystery to solve in Mineral Mischief by award-winning author Renee Hand. Joe-Joe Nut and Biscuit Bill are called in to investigate when Maple Moo’s rare and expensive mineral goes missing. The most famous detectives in Acorn Valley, they go about questioning the suspects, determined to find the culprit. I was thrilled when Renee contacted me about touring the second book in her animal detective series. I had already read and reviewed the first book in this series,The Great Pie Catastrophe, and I’ve been a fan of her Crypto-Capers series for years. Mineral Mischief combines an engaging story with factual information about rocks and minerals to create a story your children will enjoy. What I like best about this book is that the facts are woven into the storyline in a perfect way so that the reader gains the information without feeling like he’s sitting through a science class. Joe-Joe Nut and Biscuit Bill have a wonderful relationship, so they make great partners, even when they don’t see eye-to-eye on how to handle things. 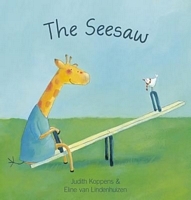 The book actually opens with a bullying scene. This is a timely subject for our children, and I was glad the author worked it into the storyline. She also manages to tie in the opening scene with the ending so the reader is satisfied at the conclusion of the story. The illustrations provided by Jake Karwoski are a wonderful complement to the text. Also included is a Did You Know? page, terms to identify rocks and minerals, a few experiments, and a picture of The Rock Cycle. All learning should be this fun! The author paid me to promote her book with a virtual book tour through Pump Up Your Book. This fee did not include a review. This review includes my honest opinion, for which I received no type of monetary compenasation. In the highly-anticipated conclusion of the seach for the Golden Monkey, the Crypto-Capers team is up to their eyeballs in danger and mystery. 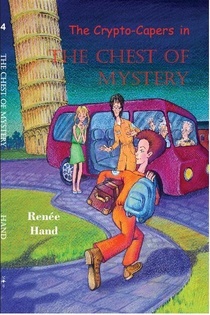 Book 4 in the series, The Chest of Mystery, picks up right where Book 3 left off. Having found two of the pieces to open the treasure room in the previous book, they discover they have only solved half the puzzle. With the Panther hot on their trail, time is running out. The team travels to Pisa, Italy to meet with the one man who holds all the answers. But when he disappears without a trace, they have to depend on each other and believe in what they know. Will that be enough to lead them to the lost treasure of the Mayans and the Golden Monkey? Wow! I’ll tell you that this book was definitely worth the wait. In Book 3, the danger had been cranked up for the Crypto-Capers. In the conclusion to this mystery, they get more than they bargained for. The Panther is closing in, Morris is in danger, and their new friend Emmanuel might be an important piece of the puzzle. In addition to Max, Mia and Granny Holmes, the fourth member of the team, Morris, joins them in the field. This is unusual, and the reader can see this as a bit of growth in this character. Speaking of growth, I’m glad to see the cover artist doesn’t forget that the kids are growing as the series moves along. All the kids seem a bit older on the cover now. We are also treated to meeting some new characters in The Chest of Mystery. Their relationships add a new element to the story, and keep the series fresh, just like adding pieces to the unfolding mystery does. The reader will also discover why she needs to hold onto the first three books in this series, as she will refer to them for help in solving the puzzles in Book 4. Author Renee Hand has won awards for her writing. It’s truly no surprise to me. She delivers consistently well-written, engaging stories. I am always eagerly awaiting her next book. The interactive element of The Crypto-Capers series will have even the most reluctant readers solving crimes with the team. These are books you don’t want to miss! Publisher:North Star Press of St. Cloud, Inc.
Renee Hand, the creative mastermind behind The Crypto-Capers, has just released the first book in her new children’s detective series, The Adventures of Joe-Joe Nut & Biscuit Bill. 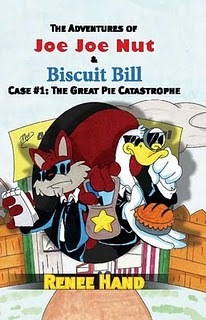 This series, which is aimed at children in early elementary grades, is about animal detectives Joe-Joe Nut (squirrel) and Biscuit Bill (duck), who solve crimes in Acorn Valley. In Case #1: The Great Pie Catastrophe, Miss Cluck’s Blueberry Pie that she planned to enter into a contest at the 42nd Annual Pie Festival has been stolen. Joe-Joe and Nut and Biscuit Bill are called in to investigate and the hunt soon begins as they follow different sets of animal tracks to uncover clues. Will Joe-Joe Nut and Biscuit Bill find the culprit before the judging begins? I was so excited to receive this book in the mail. I’m a big fan of The Crypto-Capers, so I had high hopes for Hand’s new series. I certainly wasn’t disappointed. Young readers are encouraged to use their deduction and reasoning skills to solve the crime alongside the two detectives. 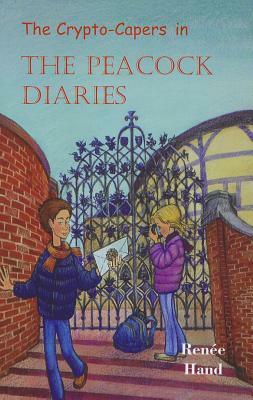 They are immediately drawn in by the storyline and the book’s quirky characters. As with human detectives who work alongside each other, Joe-Joe Nut and Biscuit Bill talk about things other than the case, like Joe-Joe Nut’s inability to cook. Moments like these bring humor to the story and make these characters fun to follow around. While I love the front cover on this book, I think the back cover is even better, with the potential suspects lined up against a wall as if they were in a police line-up. Also included are some animal facts and a quick quiz that asks readers to identify which animal the tracks on page 41 belong to. If the rest of the books in this series are as fun and educational as The Great Pie Catastrophe, the author will have another winning series on her hands. I can’t wait for Book 2! Readers can visit the Joe-Joe Nut Series portion of the author’s website for some free coloring pages. * Also available in a Kindle edition. Tweet for Literacy Giveaways – Prize Package 7 Announced! Our seventh prize package winner will be selected on November 20, 2009, at 6pm CT. Total value of Prize Package Seven is $125. 2) Aurora of the Northern Lights by Holly Hardin (autographed — an $18.95 value), the delightful Yuletide-themed picture book by one of our Tweet for Literacy sponsors. Donated by the author. 3) Ranger’s Apprentice Book 1: The Ruins of Gorlan by John Flanagan ($7.99; ages 9-12) Donated by Tweet for Literacy sponsor April Pohren. Our fifth prize package winner will be selected on November 16, 2009, at 6pm CT. Total value of Prize Package Five is $111. 1) Can You Make a Scary Face? by Jan Thomas (Ages 4-8). 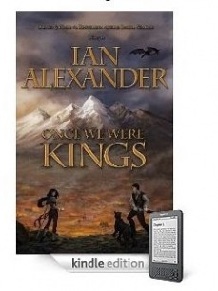 (Value $12.99) Donated by Tweet for Literacy sponsor Cheryl Malandrinos. 3) Candytuft’s Enchanting Treats: A Flower Fairies Chapter Book by Cicely Mary Barker; $3.99, ages 9-12. Donated by Tweet for Literacy sponsor April Pohren. 4) The Crypto-Capers: The Legend of the Golden Monkey by Renee Hand ($12.95 value). Readers help the detectives solve the case by figuring out puzzles! For ages 9-12. Donated by the author. 5) Bad Girls Club by Judy Gregerson. 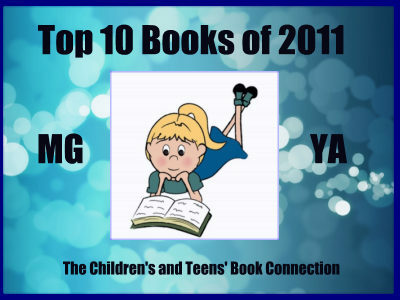 (Young Adult) (Value $16.95). An advanced readers copy donated by Tweet for Literacy sponsor Cheryl Malandrinos. 7) It Happens in Threes by Denise Robbins (signed/personalized), an $18.95 value, for Mom or Dad. Donated by the author.